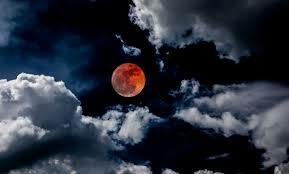 Nigeria to experience longest total lunar eclipse on Friday –Scientist – Royal Times of Nigeria. “It will be visible from 9:30.p.m. and last till 11: 20 p.m.
“It starts with a partial eclipse at 7:24 p.m. The total eclipse begins at 8.30 p.m., and ends at 10.13 p.m. The peak of the eclipse will occur at 9.22 p.m. The partial eclipse ends at 11.19 p.m.,’’ he said. The scientist said during a total lunar eclipse, the earth completely blocks direct sunlight from reaching the moon, while the only light reflected from the lunar surface would be refracted by earth’s atmosphere. The professor, however, said that the next total lunar eclipse that would be visible in Nigeria would occur on January 21, 2019. Rabiu Babatunde, the Director, Centre for Atmospheric Research in Kogi toldNAN that people should not be perturbed at the occurrence. Babatunde said that the event underscored the fact that planetary objects, including the earth were in a state of defined continuous motion. “Keeping tab on the dynamics will enable scientists sensitise the global community of any hazard associated with such occurrences,’’ he said.